GBA strives to deliver consistent quality services to provide clean, efficient, and safe facilities for Capitol Hill state employees. Automated teller machines located in GBA facilities. The Access Control Office is the point of contact for designated Agency Access Control Coordinators to manage the issuance of access cards and keys as well as maintain access control information for their facilities. This office issues replacement cards to state employees. 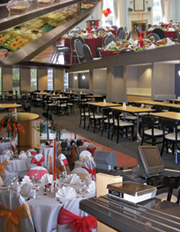 Operates two cafeterias for employees of Capitol Hill and the surrounding areas. State employees are eligible for child care through the Georgia State University. Commemorative flags of the United States and the State of Georgia are available to the public through the Georgia Building Authority. Emergency Reference Guide, Emergency Quick Facts, Bomb Threat Checklist, Evacuation Map. Provides routine custodial services to all Georgia Building Authority facilities on Capitol Hill. A public plaza located across from the Georgia State Capitol large enough to accommodate over 3,000 visitors. Parking facilities available to state employees for monthly parking. Request routine service or report GBA maintenance issues. Report concerns in the public right of way (i.e. potholes, trash pickup, street lights, traffic signals, metal plates, etc.) and or provide feedback on the City of Atlanta's public works services. Building security in the Capitol Hill is provided by the Capitol Police Services Unit. Georgia Vocational Rehabilitation, through the Business Enterprise Program, operates Snack Bars in GBA facilities. List of state holidays when all GBA Facilities will be closed. The Capitol Hill complex has many forms of transportation available to state employees and the general public. Current weather conditions for Atlanta, Georgia.